The hand2mind 1-inch Foam cubes are literally light as a feather. 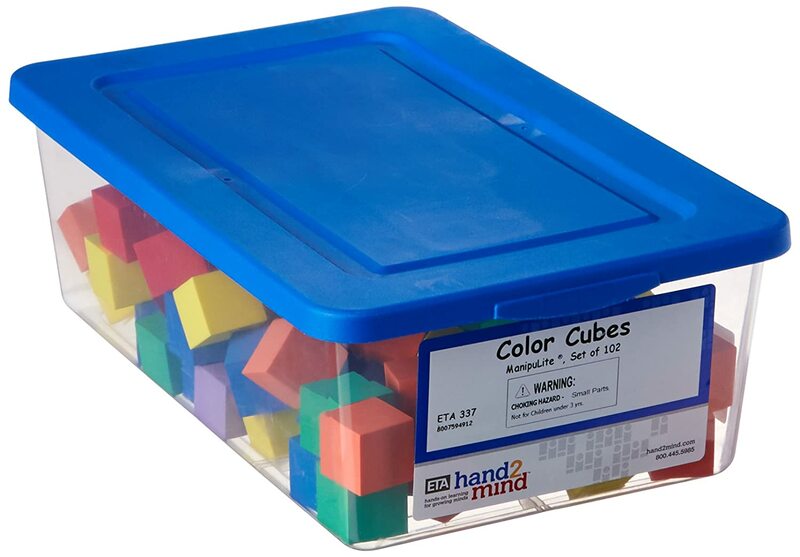 The set was described as having a total of 102 foam cubes, divided in sets of 17 cubes in 6 colors: red, orange, yellow, green, blue, and purple and storage container. Cubes are often used as a visual image representing mathematical equations...up to and including multiplication and division. They are most commonly used with younger children learning basic math, like addition and subtraction. My granddaughter is a 1st grader and said they have similar blocks in her classroom. Unlike the classroom set, These cannot be connected and they are very unstable when stacked. She found this extremely frustrating, as part of the fun in using the cubes is to "build something." Note: I quickly discovered the cubes are like a magnet for cat and dog hair. Since we have both...I spent more than a minute picking those off. The next time we played with the cubes on the table. So make sure you have an area free of pet hair to play with these. This set includes a 13" clear, plastic container, which easily accommodates the 102 cubes with plenty of room left for another set. Be Aware- The lid does NOT securely lock into place. So they can be easily spilled. I am all for just about anything that helps a child learn. My granddaughter, as well as, 2 friends (all 6 year olds) found the cubes more frustrating than anything else. All things considered, I feel this set is over-priced (current list $19.99)for what you get and the quality thereof. I struggled with rating this product. I based my opinion on 3 things - it should be educationally helpful, fun to use, and a good value. This set failed on two out of three. For these reasons, I can not, in good conscience recommend others buy a product I would not buy myself. *The colors are visually inviting to younger children. I highly recommend these be available only during supervised play, because they are so light and small.